It was the light that originally caught my eye and made me want to capture this moment. As I started to paint, though, it was the colour and vibrant colour shifts that intrigued me. 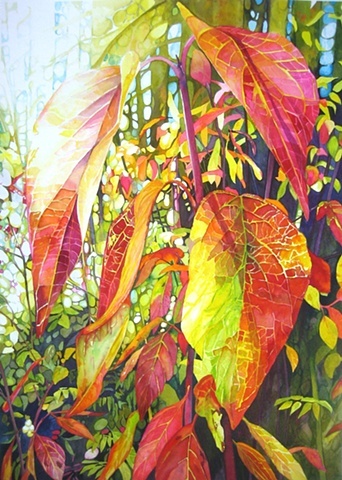 There were so many colours in just one leaf that it kept me happy and busy for hours. I found the wonderful colour "Opera Rose", a Windsor-Newton colour, and I explored how it blended and mixed with other colours. The final painting is much more successful than the photo I worked from and I'm happy to capture the glory of that beautiful day.